What do you get when you combine two fishing buddies, a discontinued product with an interesting innovation, and a healthy dose of sweat equity? You get superior quality popping corks and a true Texas garage success story! 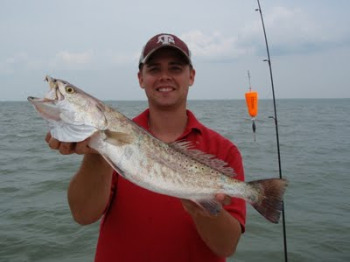 Lane Teykl of Midcoast Products tells the story of fishing with a buddy in East Matagorda Bay years ago and being out-distanced by his buddy every cast. Come to find out, Lane’s buddy was using a popping cork with a peculiar innovation. With this popping cork, the line from the reel and the line from the leader to the hook were both tied on top. This allowed for incredible distance, and amazingly no tangles! Lane was sold on them and began purchasing them from Academy and using them successfully. 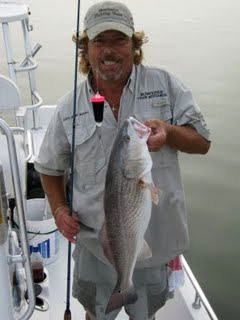 He also shared them with his fishing buddies, including Glynn Walling. Years later Academy discontinued the product, and Lane and Glynn were left with a dilemma. They could find another cork, but they didn’t know of any like the one they had been using. So they decided to make their own, and that is how the “Outcast” was born, Midcoast Products first popping cork. When I visited their shop back in October, I learned that they didn’t just build the same cork. They took it apart and figured out how it was made. Then they determined to put their spin on it and increase the quality and effectiveness of it. Suffice it to say that they have succeeded and have hundreds of satisfied customers. They didn’t stop with the Outcast, and have three more corks with the “tie all on top” innovation. Their second cork, the “Inticer”, has proven just as popular as the Outcast. The Inticer adds a smaller, sliding cork, and beads to the wire. This creates both the “pop” and the clicking sounds that make corks so effective. Land and Glynn turn out thousands of corks from their shop. This shop is about the size of a one-car garage, and they use every square inch of it. Everything is laid out, organized, and efficient. They source the materials to keep their prices down and get help from family to fill larger orders. They have a large group of guides in Texas who use their products. They also have a dedicated Midcoast Products following in Georgia. They get feedback on their products from guides and recreational fishermen alike, and that has driven some of their recent innovations. 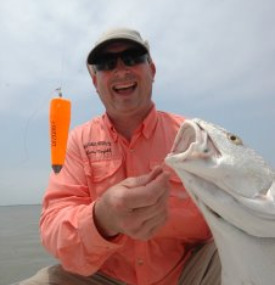 Their products are available at fishing stores up and down the Texas coast. They also are available in Louisiana, Florida, South Carolina, Georgia, and through several on-line retailers. They continue to develop new ideas through their own ingenuity and with the help of their customers. The impression I came away with was that they wanted to make a superior product to help people catch fish. “Improving the Way you Fish” is the Midcoast Products motto, and I believe they’ve succeeded. They’re working to get the word out, and when I visited their shop they showed me pictures of a recent trip they took to Georgia to meet and thank their customers. They’ve built a significant grass-roots following in Texas, especially in the mid-coast near their location. I’ve found lots of positive feedback on 2Cool and Texas Kayak Fishermen, both on their products and on Lane and Glynn themselves. From my time with Lane and Glynn, I have to echo the impression of so many others who have dealt with them and enjoy their products. They were happy to meet with SFT, to tell their story, and truly believe in their corks. They also shared valuable advice on using popping corks with artificials. Head to the SFT article on using popping corks with artificials. I came away encouraged and inspired by their operation. And they were gracious enough to answer many of my questions regarding my own ideas for a better mousetrap. So in buying a Midcoast Products cork, you’re supporting a garage-based, family-operated, made in Texas small business. You’re also buying a superior product that will enhance your fishing. We need more guys like Lane and Glynn, more businesses like Midcoast Products, to continue the proud tradition of innovation and inspiration of Saltwater Fishing in Texas! Return from the Midcoast Products page to the Manufacturers page.